Architects Agnieszka Preibisz and Peter Sandhaus have unveiled a conceptual skyscraper for Berlin with a twisted figure-of-eight structure that curves around elevated gardens and is held up by cables. Agnieszka Preibisz and Peter Sandhaus, who are both based in Berlin, developed the design to contribute to a new masterplan being put together for the eastern quarter of the city. "The state of society in the twenty-first century requires that we develop new visions for living in densely populated inner cities," Preibisz told Dezeen. "This process inherently triggers an essential confrontation of material and social values, and so there is a nascent yearning for an architecture that offers a high degree of potential for community." 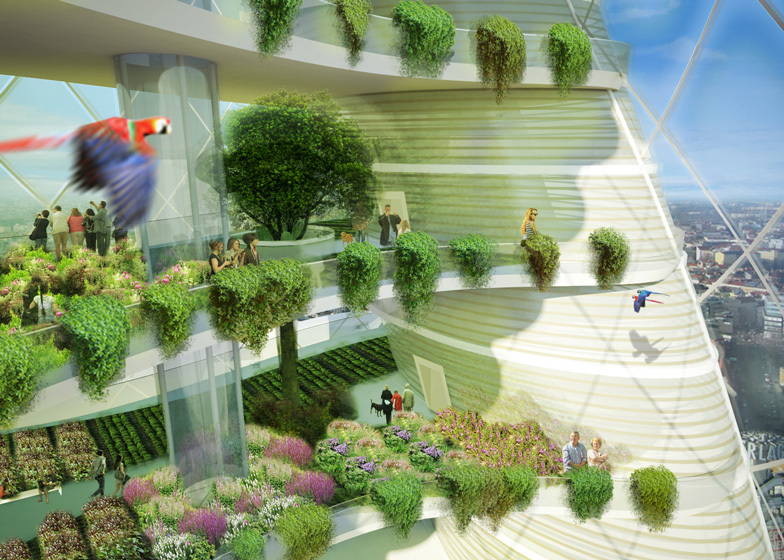 Describing the building as a "vertical garden city", the architects have planned a network of gardens and greenhouses that would slot into the two hollows of the figure-of-eight, intended to serve a growing desire among city dwellers for self-sustaining gardening. Residences would be arranged to encourage neighbours to interact with one another, fostering a sense of community that the architects compare to social networks. "While in social networking, the border between the public and the private spheres is being renegotiated, architecture and urban planning of cities such as Berlin lags behind these significant social and demographic changes," they explain. Named Green8, the tower is designed for a site on Alexanderplatz. The architects are now consulting with an engineering office to assess the viability of the structure. How Do We Want To Live? While trying to answer the query of how and where to house, many modern families today are torn between the desire for a pulsating urban life and the craving for a lifestyle in harmony with nature. Our identification with and our desire for a free and urban life style defined by short distances to work, excellent public transportation, and proximity to cultural and commercial amenities, does not need to end with the decision to start a family or with retirement from active professional life. Current trends towards a 'sharing-spirit' and a new participation in the community life counteract the anonymity and isolation in the metropolis. While in social networking, the border between the public and the private spheres is being renegotiated, architecture and urban planning of cities such as Berlin lags behind these significant social and demographic changes. The unease with the global imperative of continued growth propagated by financial markets, seems to be spreading. Confidence in industrial food production finds itself nowadays significantly eroded. At the same time also the mass production of organic and healthier food has its limits and fails to appease growing groups of customers. The longing for self-sustaining gardening and for knowing about the origins of what one is eating, are the most important reasons for the current boom in urban gardening. What do these developments mean for architecture and urban planning? How do we want to live and house in the future? As an integrative solution to this dilemma, the architects Agnieszka Preibisz and Peter Sandhaus are proposing project Green8 for a vertical garden city on Alexanderplatz in Berlin. The residential high-rise structure is based on a business model of a cooperative collective. It envisions a self-determined community encompassing all generations. With its generous greenhouse and community spaces Green8 offers to organise not only the food production but also the sport and leisure activities, as well as the care of children and seniors. Green8 reflects a dream come true: living in the centre of the city with breathtaking panorama views, while having one's own vegetable garden at one's doorstep. Thanks to its cooperative and integrative principles, this housing concept is economically efficient. This form of home ownership is free from many constraints of real estate or land speculation, and the long term costs are lower than those of conventional homes. Green8 is not a house. It is a life form.